Since opening its doors in 1968, Foxfire has enjoyed a great heritage as one of the premier golfing destinations in the Sandhills and throughout the Southeast. Over the years, thousands of passionate golfers, including a number of famous names, have graced the rolling fairways and treacherous greens set beneath the towering pines and Carolina skies. Foxfire has truly had a glorious past. Don’t wait to be a part of what has become one of the most traditional experiences the Sandhills and Pinehurst Village area has to offer. 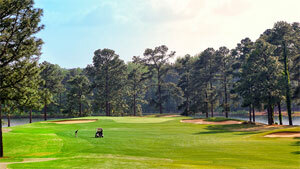 Come experience two of the finest layouts the Village of Pinehurst area has to offer. You will fall in love with either of the superbly conditioned Gene Hamm designed classics. Experience his flair for classic golf design on either the Grey Fox or the Red Fox course. Both rely on natural contours of the land and challenge players of all skill levels with tree-lined fairways, strategically placed bunkers, and generous bentgrass greens. Play at Foxfire and you will be rewarded by the natural beauty and great conditions on either of the ageless courses Foxfire has to offer.